Muncie, Commercial/Parker, Gresen/Parker, Brand, Husco, Sauer-Danfoss, and Salami are just a few of the brands we stock and service. 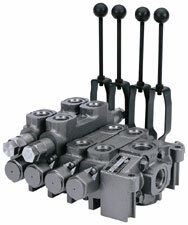 We carry open-center, closed-center, monoblock, and sectional control valves. We also stock relief, cushion, flow control, and check valves. Please call us for all your mobile hydraulic needs.